(Jan 24): Add Southern Green Canyon and Mars Blend to the growing list of American crude that’s challenging OPEC’s dominance in the world’s biggest oil market. Cargoes of the two varieties produced in the Gulf of Mexico, which are heavier and more sulfurous than supply from US shale fields, are poised to flow into Asia as they turn cheaper relative to similar-quality crudes from nations such as Saudi Arabia and Oman. The deal between producers worldwide to cut output and ease a glut is boosting the cost of Middle East supplies, priced against the Dubai benchmark, because most of the reductions are coming from the region. Meanwhile, US marker West Texas Intermediate is turning relatively weaker as a rebound in global crude prices from the worst crash in a generation is spurring more American rigs into action. Shale oil that was already cheap enough to sail to Asia is now being joined by cargoes from more traditional fields. “Flows of Mars and Southern Green Canyon to Asia are extremely rare,” said Nevyn Nah, a Singapore-based analyst at industry consultant Energy Aspects Ltd. But “the move is currently viable as Dubai has strengthened against other benchmarks such as WTI, following the Saudi-led output cut,” he said. Asia is buying oil from as far away as the US because of a shortage of supplies of medium-heavy crudes, according to Nah. Refinery shutdowns for maintenance work on the US Gulf Coast mean that grades such as Southern Green Canyon are available and cheap enough to be shipped to other regions, he said. WTI’s cost fell below Dubai in December for the first time in at least three months. The US benchmark was at a discount of 85 cents a barrel to Dubai on Monday. Mars and Southern Green Canyon are even cheaper than WTI because they are more difficult to refine. Oil explorers last week put the most rigs back to work in US oil fields in almost four years, according to data from Baker Hughes Inc. Oil output in the nation rose to the highest level since April in the week ended Jan 6, while crude stockpiles surged by the most since November during the same week. A Japanese refiner bought 500,000 barrels of Southern Green Canyon for March arrival, while Mars Blend is being offered to Asian customers. The tanker Manifa is sailing to Singapore after loading Southern Green Canyon, Eagle Ford shale crude and fuel oil via a series of ship-to-ship transfers, according to Matthew Smith, director of commodity research at ClipperData LLC, a firm that analyzes and tracks oil flows globally. Such arbitrage trades became viable as cargoes turned relatively cheaper compared with similar-quality Oman crude, a Bloomberg survey showed last week. 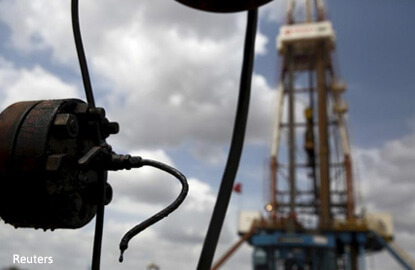 Additionally, the premium for Brent crude, the benchmark for more than half the world’s oil, against Dubai narrowed to a 16-month low of US$1.46 a barrel this month, providing an incentive for Brent-linked grades to flow from the Atlantic Basin to the Asian market. Such shipments from the Americas as well as Europe and Africa are making oil sales to Asia more competitive. It’s also influencing the strategy of traditional dominant suppliers such as Saudi Arabia. In January, the largest oil exporter was focusing its output curbs on its Arab Medium and Arab Heavy grades while continuing to pump lighter crudes to compete better with US shale and African supply. But that’s in turn boosted the cost of more sulfurous heavy crudes in Asia, creating an opportunity for relatively cheaper and similar quality US supply to flow east.